Welcome to Dust Control Solutions Ltd. We design manufacture and install all types of dust control systems, pollution control systems, odour control systems and fume extraction systems for industries in the UK, in particular Aberdeen. We also cover all areas of Scotland, Northern England and Ireland. Odour control can also be managed. Dust Control Solutions Ltd have experience in working with companies dealing with waste water treatment facilities and food processing, landfill and waste disposal, amongst others. Ventilation systems providing cooling air, systems designed to provide spot cooling for personnel working in extreme temperatures or environmental hazardous areas can be implemented to reduce the problems. We provide full LEV testing of all types of extraction systems such as dust extraction, fume extraction and wood dust extraction. 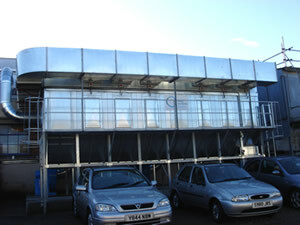 Dust Control Solutions is amongst the most prestigious ventilation companies in the UK. Our services engineers are available on call 7 days per week 52 weeks in the year in Aberdeen and the surrounding area. On occasion we can supply temporary extraction should a serious breakdown occur.